One of Newcastle United's greatest goal scoring partnerships. | NUFC Blog. One of Newcastle United’s greatest goal scoring partnerships. With the ship’s captain charged and then acquited of the murder of Ted Robledo, one of the famous Robledo Brothers who played in United’s 1951 cup winning team, no-one was to ever find out the truth of what happened to Ted that fateful night. It was 1970 when the ship set sail from Dubai enroute to one of the oil rigs in the Gulf where Ted worked after giving up football. Some claimed a fight broke out between Ted and the captain but people who knew the mild mannered Ted said that was totally out of character and they didn’t believe it. Despite several trips by his family Ted’s body was never found and the truth to this day never uncovered. Born in Chile to an english mother and chilean father, the Robledo brothers found themselves moving to England as small children when their home sick mother moved back to the small mining town in South Yorkshire where her family lived. After playing amateur football while working down the pit, George signed professional terms with Barnsley in 1943 when he was 16. On the opening day of the postwar season George was to score a hat-trick on his league debut. George was a natural sportsman, with a powerful physique. 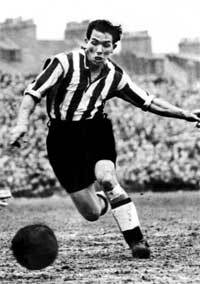 He was good in the air and an excellent finisher.Ted Robledo was the less gifted of the Robledo brothers, and a makeweight in the deal that was to bring the talented George Robledo to Tyneside in 1949. George scored on his league debut in the 2-1 win over Sunderland to immediately become a favourite of the fans. “Pancho” as George was known to his Newcastle team mates, quickly established what was to become one of the great goal scoring partnerships in Newcastle United’s history when he partnered the great Jackie Milburn. 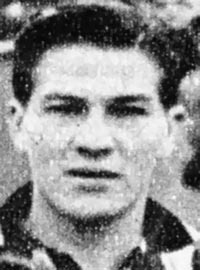 By the end of his first season at the Toon he had earned himself a call up to the Chilean national team to play in the 1950 World Cup being held in Brazil. By the time of the second Wembley final against Arsenal in 1952, Ted had joined his brother in the team and George scored the winning goal that day to award Newcastle the FA Cup for the second successive year. George finished the 1951-52 season as the league’s top goal scorer with 33 league goals versus Jackie Milburn’s 28. The 1952-53 season saw him score 18 times and by the time he left Newcastle he had scored 91 goals in 166 games for the Toon of which 82 goals were in the league, making him the highest scoring overseas player in the top flight, a record that was to stand for almost 50 years. After being courted incessantly by several Chilean clubs the lure of their homeland proved too much, and by the end of the 1953 season they joined Colo Colo of Santiago, five times national champions. George finished top goal scorer in Chile for the next two years where the Robledo brothers were hero worshipped. George finally retired from football in 1961 and led a quiet life as a sports master at an english school in Chile, and a director of Colo Colo. He died of a heart attack 20 years ago but will be forever remembered with great affection from Toon fans of that era (my dad used to wax lyrical about him!). Ted was tough, a hard worker, a good passer of the ball and good team player. Sadly, we will never know for sure what happened to him. What we do know is the Robledo Brothers play an important part in our history. Newcastle Utd Rising – NUFC Blog team interviewed on ESPN STAR. This article came out of the blue. Good player he sounds. Yes it did come out of the blue a bit. I’m just fed up of the current situation as everyone is, so thought I would think about some good times in our past and it led me to this. I did write a big preamble to the article to try to link it to the current situation but it made it too long so I chopped it out. Anyway you’re right he was a great player. How we could have done with some of these goalscorers last season! Like you and others I am really peed off with are current situation and sick of reading about it, thats probably why this is the first article i fully read on here- no disrespect to anyone but its getting depressing and boring now and something different is what I like to hear. There’s nothing wrong with making it a longer piece if it’s good, Deb. “…A celebration dance was held at the Oxford Galleries for the players and their wives and there were rumours amongst the players that the wives would be presented with handbags full of cash. Illegal payments were rife at the time, but at Newcastle there had usually been very little on offer. Joe Harvey’s Guide Posts to Wembley. “Hit them once. And instead of running round the field shaking hands and doing fancy dances of rejoicing, roll the sleeves a little higher and set about the business of hitting them again. We had a centre-forward in jackie Milburn who is a prime goal-getter, and it was part of our tactics to see that he got the chances to shoot those goals. Playing to the whistle. Concerning at least three of our very important goals there was what the critics called a shadow of doubt …. it isn’t the time to hesitate. Play on. So long as the whistle hasn’t sounded keep on and bang the ball into the net”. Glad you enjoyed it. I’m really interested in our history. As you know we’ve had some great players over the years and it’s important to remember them. I know Worky is planning a section on our great players. Thanks for posting that. What a let down regarding the newspapers!! Pity some of our players at Villa didn’t follow his direction. morning deb. think we will get any news today? I wish we would but I’ve got a funny feeling it will be tomorrow. What about you? i think there will be news this week personally. with the interested parties having looked at the data room (apparently) i think some of them will have made an offer by now. Ithink you’re right. Not sure what to make of the Keith Harris trip to the US reported in the press at the weekend. If he was there everyone automatically assumes it’s to do with the Toon, but I’m sure he has other clients he is dealing with also. It would be great if we were bought by some of the names being bandied about in the US, at least they appear to have good credentials in running sports teams and will provide some investment. Well lets keep our fingers crossed for good news, in fact for any news! America were so close last night, they did really well to get to the final though. It’s inevitable that America will become a force in football, I wonder if this is the start of that? 52 – I coached kids (4-18 yr olds) across there for 3 months in the summer. The standard was a lot higher than I expected. There were quite a few ex-pros across there involved in the clubs and coaching (though not necessarily all high profile either before or after they went to the States). But regardless of status, all of them agreed in the next 10 to 15 years the US would be challenging in the biggest competitions. That was about 8 years ago so they’re just about on or ahead of schedule. It was bound to happen with their massive population and resources. Interesting post Deb. My father would have watched them play. 52 – And they don’t do things by halves really do they? So, yeah you’re absolutely right. Interesting. I am originally from Rancagua, Chile, the town where Jorge (George) Robledo lived for many years before settling in Vina del Mar, on the coast of Chile. I was friend of his daughter, Elizabeth (Lola). He died relatively young, at 63. Funny I did not know anything about his sport history, he was just my friend’s father.